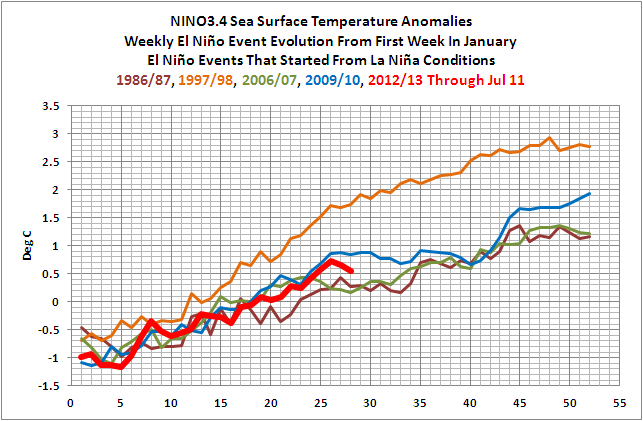 This entry was posted in El Nino-La Nina Processes, SST Update. Bookmark the permalink. 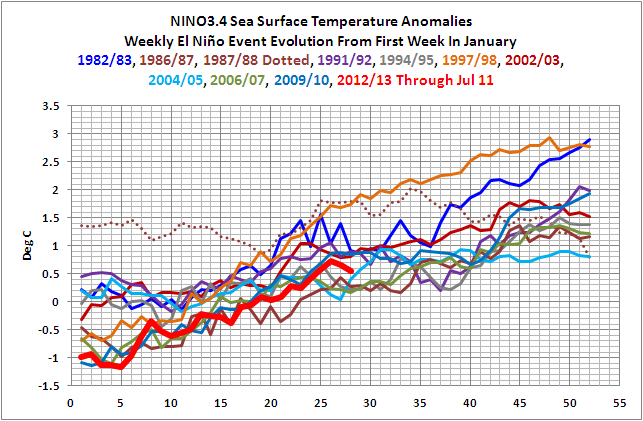 10 Responses to How Does the Evolution of the 2012/13 El Niño Stack Up Against the Others since 1982? In an El Nino situation we should be seeing a significant East anomaly (slack or reversed trades), but we aren’t seeing it. The east/west component of the trades appears to be “average”. So far everything I would see would indicate ENSO neutral expectations but I am not privy to any longer range trade wind forecasts. Hi, Bob. I’ve been reading your blog posts and updates with great interest for a couple of years now and am really looking forward to your new book. Glancing through the different chapter headlines, though, I stopped at #5.12: “Does Downward Longwave (Infrared) Radiation from Anthropogenic Greenhouse Gases do Anything More Than Increase Evaporation?” I wonder, how do you picture this effect? In your mind, is it direct or indirect? What is your stance on the issue of whether or not so-called ‘back radiation’ from the (cooler) atmosphere can do any thermodynamic work on the (warmer) surface at all? In my opinion it cannot. It can only reduce the rate of (radiative) heat loss from the surface. Hence, it can never warm the surface, nor can it provoke increased evaporation – directly, that is. What it can do, still in my opinion, is shift the balance slightly between the different modes of heat loss that the (sea) surface has at its disposal. Impeded IR flux from the sea surface would in and by itself lead to an increase in ocean heat content, as long as shortwave down remained constant. To retain its balance with incoming, the ocean would then have to rather increase its rate of evaporation. So, an indirect effect. Is this what you had in mind? If not, I’m not sure it’s wise to concede the AGW claim that IR from the atmosphere would be able to do any direct thermodynamic work on the surface, when there’s no need to. If you give’em an inch …! 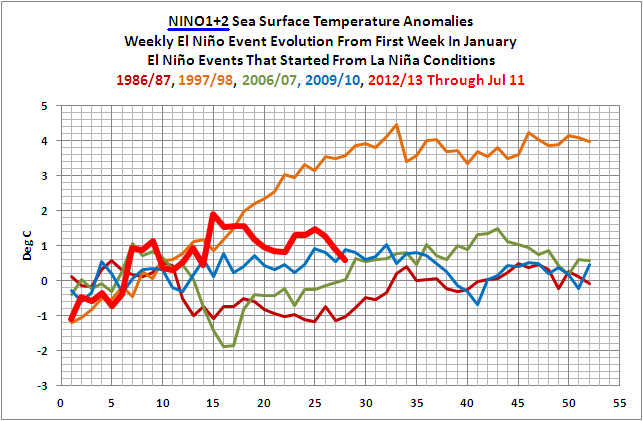 George: During the satellite era, I don’t believe that NINO3.4 sea surface temperature anomalies have gone a full-fledged La Niña into El Niño conditions, and then back into ENSO-neutral conditions. I can’t say if it happened before the 1980s, I haven’t looked, but I think it would be a first in the past 30 years. It would be interesting, to says the least, if it happened. Don B: I discuss the effect of ENSO on the jet streams, and through the changes in the jet streams, the local effects on weather. That’s in chapter 4.14. And thanks for the link to the post about Neville Nicholls’s QNA at Roger Pielke Jr’s website. I believe I have a place for a link to it in the book. If not, I’ll create one. Kristian: I had planned to present the AGW arguments for the effect, but then discuss how the sea surface temperature and ocean heat content records don’t support it, that the warming can be explained with natural variables. 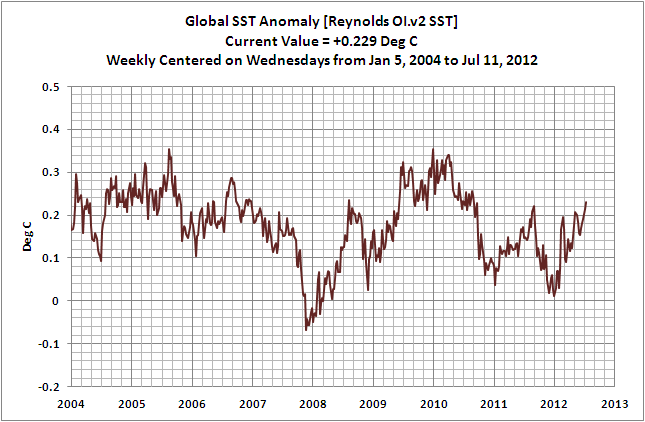 Bob there is a new post at the Marohasy site about AGW not causing increasing ocean warming. Luke has stated that ocean warming at depth is caused by AGW. Just thought you should know that he claims the science proves it’s AGW. Jennifer has been quoting the Stevenson paper stating it’s not due to AGW. Luke claims measurements prove he’s wrong and out of date. He quotes Real climate etc. Neville: I’ll respond to Luke at Jennifer’s tomorrow. 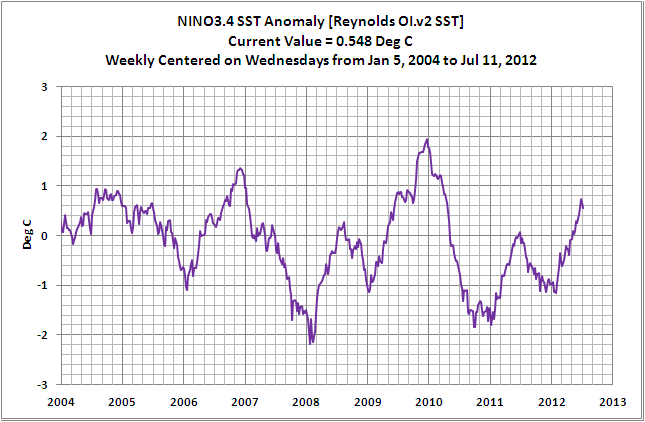 Pingback: Tisdale on the problems with ENSO models | Watts Up With That?